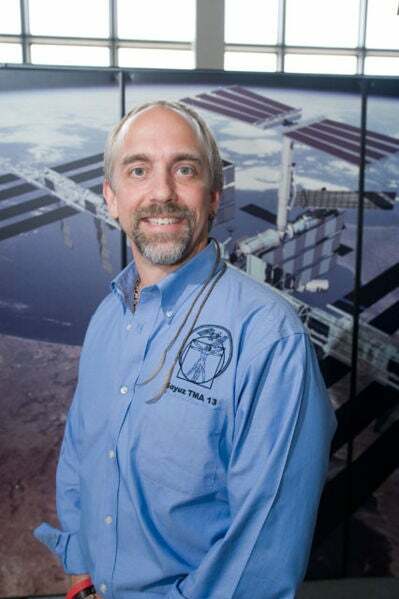 Richard Garriott, son of an astronaut and science fiction/fantasy video game icon, will join two self-proclaimed sci-fi addicts in holy matrimony 36,000 feet in the air. The New York couple Noah Fulmore, 31, and Erin Finnegan, 30, are paying a small fortune to throw their wedding on a Zero G Corporation flight. Zero G is the only federally-approved tourist flight service that simulates spaceflight by flying in parabolic arcs between 36,000 and 24,000 feet. (That's flying them up and then dropping them and then going back up to do it all again). Zero G charges $5,200 a person per flight. Daily News reports that the couple is the first to exchange wedding vows in freefall. The pair met at an NYU science fiction club in 2000 and began dating in 2002. They went to so many "conventional" weddings they decided to do something out of this world. "Since this is the one time in our lives that we were going to do this [get married], we thought we should make it a once-in-a-lifetime event," Fulmore said. "My mom thinks I'm absolutely nuts."